Information systems has been practiced since long time to gather and store information, to develop precise reports for workforces, and to produce aggregate reports for managers (Crockett, 1992). There are various types of information system which are elaborated below. Top managers make strategic decisions like Middle managers make tactical decisions, Line managers make operations decisions, Knowledge workers create and integrate knowledge, clerical workers use and manipulate information. An MIS mainly concentrates on operational efficiency. Manufacturing, marketing, production, finance, and other functional areas are supported by MISs and are linked through a common database. Since 1980s, there are drastic changes occurred in technology that decreased the cost of information systems but more powerful than earlier systems. People instantly recognized that computer systems could support additional decision-making activities. DSS is an interactive information system that provides information, models, and data manipulation tools to support and make decisions in semi-structured and unstructured situations. A decision support system (DSS) is an organized collection of people, procedures, software, databases, and devices that support problem-specific decision making. The focus of a DSS is to make wise decisions. Whereas an MIS helps an organization "do things right," a DSS helps a manager "do the right thing" (Fagerholt, 2009). A DSS goes beyond an old-fashioned management information system through giving instant solution to problems. Many of these problems are unique and complex, and key information is often difficult to obtain. A DSS recognizes that different managerial styles and decision types require different systems. A DSS can include a collection of models used to support a decision maker or user (model base), a collection of facts and information to assist in decision making (database), and systems and procedures (user interface or dialogue manager) that help decision makers and other users interact with the DSS. 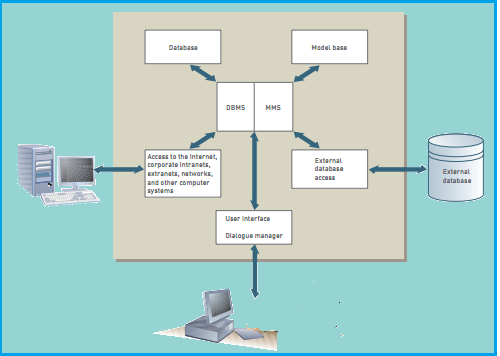 Software called the database management system (DBMS) is often used to manage the database, and software called the model management system (MMS) is used to manage the model base. A group support system includes the DSS elements just described as well as software, called groupware, to help groups to make effective decisions. It is highly interactive system that provides a flexible access to information for monitoring results and general business conditions. Execution information system use both internal and competitive information and it is User-friendly interface. An Executive Information System is an effective tool that provides direct on-line access to relevant information in a convenient and controllable format. Significant information is timely, accurate, and actionable information about aspects of a business that is very useful to the senior manager. The suitable and navigable format of the system means that it is precisely designed to be used by individuals with limited time, limited keyboarding skills, and little direct experience with computers. An Executive Information System is easy to navigate so that managers can recognize broad strategic issues, and then discover the information to find the root causes of those issues. Executive Information Systems differ from traditional information systems in various ways. Executive Information Systems are specifically tailored to executive's information needs. Executive Information Systems are able to access data about specific issues and problems as well as aggregate reports. Executive Information Systems offer extensive on-line analysis tools including trend analysis, exception reporting & "drill-down" capability. Executive Information Systems access wide range of internal and external data. Executive Information Systems are particularly easy to use (typically mouse or touchscreen driven). Executive Information Systems are used directly by executives without assistance. Executive Information Systems present information in a graphical form. Main objective of an Executive Information System is to support managerial learning about an organization, its work processes, and its interaction with the external environment. Informed managers can ask better questions and make better decisions. Vandenbosch and Huff (1992) conducted a study and found that Canadian firms using an EIS achieved good business results if their EIS promoted managerial learning. Firms with an EIS designed to maintain managers' "mental models" were less effective than firms with an EIS designed to build or enhance managers' knowledge. Another purpose for an Executive Information Systems is to allow timely access to information. All of the information contained in an Executive Information Systems can typically be obtained by a manager through traditional methods. However, the resources and time required to manually accumulate information in various formats, and in response to ever changing and ever more specific questions usually inhibit managers from obtaining this information. Often, by the time a useful report can be compiled, the strategic issues facing the manager have changed, and the report is never fully utilized. An Executive Information Systems has an ability to direct management attention to specific areas of the organization or specific business problems. Some managers perceive this as an opportunity to discipline subordinates. Some subordinates fear the directive nature of the system and spend a great deal of time trying to outwit or discredit it. Neither of these behaviours is appropriate or productive. Rather, managers and their subordinates can work together to determine the major causes of issues highlighted by the EIS. Barriers of EIS: There are many ways in which an EIS cannot work. Many high cost EIS projects have been cancelled, implemented and hardly used, or implemented and used with negative results. An EIS is a high risk project precisely because it is intended for use by the most dominant people in an organization. Senior managers can easily misuse the information in the system that have harmful effects on the organization. Senior managers can refuse to use a system if it does not respond to their instant personal needs or is too difficult to learn and use. Unproductive Organizational Behaviour Norms: Issues of organizational behaviour and culture are major barriers to effectual Executive Information Systems. Because an EIS is typically positioned at the top of an organization, it can create powerful learning experiences and lead to extreme changes in organizational direction. However, there is also great potential for misapplication of the information. Green, Higgins and Irving (1988) found that performance monitoring can promote bureaucratic and uncreative behaviour, can unduly focus organizational attention to the point where other important aspects are ignored, and can have detrimental impact on self-esteem. Major barrier to EIS efficacy is the way in which the organization uses the information in the system. Managers must be conscious of the dangers of statistical data significant. Even, to be skilled at interpreting and using data in an effective way. The most important is the manager's ability to interconnect with others about statistical data in a non-defensive, reliable, and helpful manner. To make effective use of an EIS, mangers must have the self-confidence to admit negative results and focus on the resolution of problems rather than on denial and blame. Since organizations with limited exposure to planning and targeting, data-based decision-making, statistical process control, and team-based work models may not have dealt with these behavioural issues in the past, they are more likely to react protectively and discard an EIS. Technical Excellence: A study conducted by Vandenbosch and Huff (1988) and found that the technical excellence of an EIS has an inverse relationship with effectiveness. Systems that are technical masterpieces tend to be inflexible, and disrupt innovation, experimentation and mental model development. In information system, flexibility is important because an EIS has an ability to direct attention to specific issues in an organization. A technical masterwork may accurately direct management attention when the system is first implemented, but continue to direct attention to issues that were important a year ago on its first anniversary. There is considerable danger that the investigation of issues necessary for managerial learning will be limited to those subjects that were important when the EIS was first developed. Managers must comprehend that as the organization and its work changes, an EIS must continually be modernised to tackle the strategic issues of the day. Technical Problems: Unexpectedly, technical problems are also regularly reported as a substantial barrier to EIS accomplishment. The most difficult technical problem is integrating data from a wide range of data sources both inside and outside the organization and it is also one of the most critical issues for EIS users. The ability to integrate data from many different systems is important because it allows managerial learning that is unavailable in other ways. An EIS will be effective if it can overcome this challenge, allowing executives to learn about business processes that cross organizational boundaries and to compare business results in dissimilar functions. Another technical problem that has damaging effect on EIS projects is usability. Senior managers simply have the choice to stop using a system if they find it difficult to learn or use. They have very little time to invest in learning the system, a low tolerance for errors, and initially may have very little incentive to use it. Even if the information in the system is useful, a difficult interface will quickly result in the manager assigning an analyst to manipulate the system and print out the required reports. This is counter-productive because managerial learning is enhanced by the immediacy of the question- answer learning cycle provided by an EIS. If an analyst is interacting with the system, the analyst will acquire more learning than the manager, but will not be in a position to put that learning to its most actual use. Misalignment between Objectives and EIS: Lastly, barrier to EIS effectiveness was that the ability of an EIS to direct organizational attention can be destructive if the system directs attention to the wrong variables. This system refers to the type of computer machinery and software used to digitally create, collect, store, manipulate, and relay office information needed for accomplishing basic tasks and goals. Raw data storage, electronic transfer, and the management of electronic business information comprise the basic activities of an office automation system. Usually, there are three basic activities of an office automation system: storage of information, data exchange, and data management. It has varied application where hardware and software combine to fulfil basic functions that are needed to successfully accomplish the goals for a specific business. Storage of information would be the computer or a computer like system. Data Exchange would be a fax, phone, or some type of communication hardware. Data management would be using specific software tools to organize and maintain data. Characteristics of OAS include sophisticated electronic equipment and communication systems involve people and procedure and technology involves the use of computers, in conjunction with other electronic equipment. Advantages of OAS are reduced involvement in clerical work, less work force for large volume of data. Disadvantages of OAS are expensive first time More Technical Resist to change, Training cost and time, no use while electric power off. Improvements in Efficiency: Allows the same work to be accomplished in less time. Improvements in Effectiveness: Helps increase intellectual specialization within an organization. Improvements in Focus: Allows more time to be devoted to the organization's primary mission/function. Work Elimination: Eliminates the need for some tasks or accomplishes them automatically. Less Rework: Reduces the amount of work that must be redone. In the arena of Artificial Intelligence, machines take over complex, risky, routine, or boring tasks, such as welding car frames or assembling computer systems and components. Many automobile companies such as Honda Motor has invested huge money on advanced robotics that allows a person to give orders to a computer using only his or her thoughts. The new system uses a special helmet that can measure and transmit brain activity to a computer (Rowley, 2009). Another leading company of US, Staples used robot in a distribution centre in the Denver area is able to locate items in a 100,000 square foot warehouse and pack them into containers to be shipped to other Staples stores (Steiner, 2009). Natural language processing involves computers understanding and acting on verbal or written commands in English, Spanish, or other human languages. Learning systems allow computers to learn from past mistakes or experiences, such as playing games or making business decisions.